It seems like you’ll be punching a clock forever, right? Well, one day, you’ll likely stop spending 9 to 5 at a desk and will enjoy your golden years in retirement. But that’s assuming everything plays out nicely and you have enough money set aside to do so. Stressful, right? Well, according to a 2016 Retirement Income Strategies and Expectations survey by Franklin Templeton Investments, 70% of millennials are stressed and anxious about saving for retirement. So if you’re one of the millennials who gets anxiety every time mom or dad brings up the importance of your retirement funds, take a deep breath. We’ve got 50 easy-to-digest ways that can get you on the right track today so you’re ready to celebrate in style once your 65th birthday rolls around. “It’s never too late, and it’s never too early, to start saving for retirement,” Ty J. Young, CEO of Ty J. Young, Inc., a nationwide wealth management firm, said. The longer you wait, the more you have to save every month. You can get away with just $100 a month and be in good shape. “A healthy relationship with money is absolutely crucial,” Attila Morgan, Nuvision Credit Union’s manager of community engagement and public relations, said. If you shy away from planning for retirement, you’ll pay the consequences down the line. 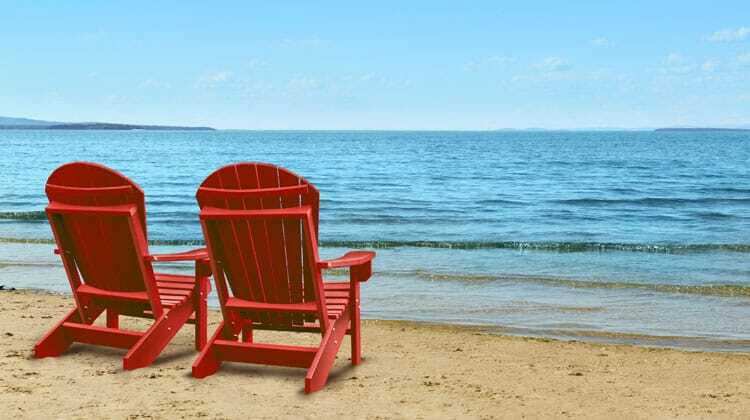 “It’s crucial that you know how much money you will need in retirement,” Roger Cowen, a retirement planner and owner of Cowen Tax Advisory Group in Hartford, Connecticut, said. This way, you’ll have an easier time figuring out an amount to save or invest. Don’t forget about inflation. There are bills that must be paid but you also need to pay yourself. This doesn’t mean buy something new. It means putting money aside for your future. As Warren Buffett said, “Don’t save what’s left after spending, spend what’s left after saving.” Set up a basic budget and make sure you put your savings on auto-pilot. You won’t gain anything from hiding money under the mattress or in the couch cushion. Take that money to the bank. Sure, interest rates may not be high, but it’s still extra money you wouldn’t have had otherwise. I use CIT Bank, they offer one of the highest yields on online savings account in the country. Experts generally recommend having at least 6 months worth of expenses socked away for emergencies. The amount you’ll need will change over time, so make sure it stays at the level you’d need. You’ll want to use your emergency fund for “unexpected events, rather than dipping into your retirement savings,” Chad Smith, wealth management strategist at HD Vest, a financial services firm in Irving, Texas, said. And just so we are clear, an unexpected event is a car accident, not a 50% sale at the mall. “Having the money directly transferred will make [saving] easier,” Cowen said. When you make things automated, you never have to think about it. It just happens. How awesome is to save money and even invest money without thinking or working at it? My favorite auto-saving option is Digit and my favorite auto-investing option is Betterment. If you’re paying for multiple streaming services as well as cable, decide what you can cut. Same goes for multiple magazine subscriptions that you read online. Anywhere you’re doubling up, try to cut back. if you aren’t sure where you are doubling up, just use Trim. It’s free and they will tell you where you are wasting money. “Start small. Pay on time and pay of the balance in full at the end of each month,” Cowen said. This can help you maintain good credit. Again, my favorite is Betterment. But if you want more control, be sure to look into Motif Investing. “If you aren’t contributing enough to get the free match from your employer, you are throwing money away,” Cowen said. Roth accounts are not taxed if you make withdrawals after retiring. “Starting young is the key to retiring rich and the Roth account is the best way to accomplish this,” according to Adam Bergman, the president of IRA Financial Group. “Do not put all of your eggs in one basket. Diversification is key, ” Richard W. Rausser, senior vice president of client services at Pentegra Retirement Services in White Plains, New York, said. “Increase your 401K savings every time you get a pay raise, no matter what,” Rausser said. This helps you to avoid lifestyle creep. “As you accrue a larger portfolio, take your winnings off the table often,” Young said. This way, you aren’t leaving all you earn at risk. Just like you check in on your portfolio, you’ll want to look at your personal finances. Young recommends you “review your finances every three months to determine where you can save.” A great option to make this easy is Personal Capital. Open a free account and link your accounts. They take care of the rest. You just review and make any changes you think are needed. If you withdraw from your retirement plan before you’re at the qualifying age to do so, you’ll face a penalty and won’t benefit from this account the way you could. “It’s important that you write down a budget to help you spend only what you can afford and prevent you from racking up credit card debt,” Cowen said. “If a new grad chooses to live at home for two years after graduation and puts the money that he/she saves on rent toward retirement, this grad could retire five years earlier,” Cowen said. There are plenty of big cities that are affordable, so if you’re spending too much now that prevents you from saving for your future, you may want to consider relocating. The big house with all the bedrooms may seem like a nice idea, but if it’s out of your price range, you’ll find yourself in hot water. You can go here to learn how to decipher how much house you can truly afford. “Use savings and financial planning software so you can manage how much you save, spend, invest and donate,” Cenedella said. Garner experience from those who have “been there, done that.” You never know what gems of wisdom they may have. “Even an extra $5,000 can help at each stage,” Cenedella said. “The compounding effect is enormous, and there’s always room to negotiate.” Just look at the chart below for proof. 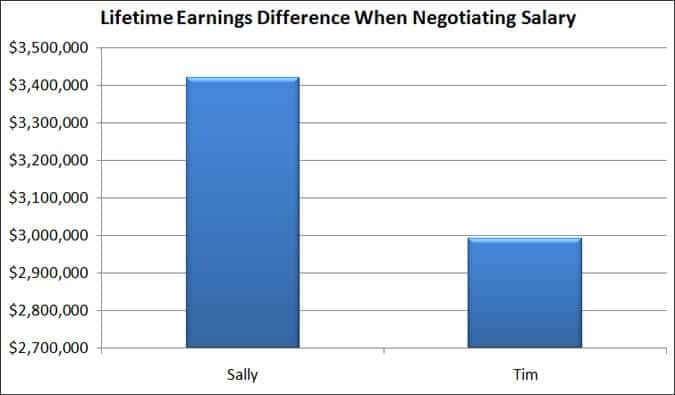 It shows the lifetime earnings of Sally and Tim. Sally negotiated her salary at her first job and earned $40,000 with a 3% raise each year thereafter. Tim. just took the $35,000 he was offered. He also earned a 3% raise each year. But by the time they were 65, Sally earned over $425,000 more than Tim! While it is great to always negotiate your salary, even doing it once pays off big time. If your company downsizes, what will you do? It’s important to have a fallback plan at any age in case your current one doesn’t work out. Racking up a lot of credit card debt means additional interest fees and serious stress. Only charge what you can truly afford. “Teach guitar lessons, buy items at a garage sale and then resell them online or pet sit for a family,” Cowen suggested. “These are just examples of personal hobbies that could turn into extra cash.” Then save that money and let compounding grow it. Whether you post your items on eBay or have a garage sale, it’s better to profit from what you don’t use than to have it lying around taking up space. The money you get can go toward your IRA, savings or even paying off debt. The shiny new cars on the lot may be alluring, but if your car still runs fine and doesn’t require a lot of repairs, it may be smart to hang on to it. Whether it’s how much you pay for cable or your car insurance policy, make sure you’re getting the best deal. If you’re carrying a credit card with an annual fee that you rarely use or that doesn’t offer perks that truly benefit you, consider cutting ties and getting a credit card with no annual fee. Just make sure your credit can handle the ding of canceling a credit card before doing so. “Co-signers are on the hook for timely loan repayment, so any missed payments, even for someone else’s loan, can hurt a credit score,” according to credit bureau TransUnion. The sooner you get these off your back, the less you will pay in interest over the years. You can check out this free service to see a handful of refinancing options. It’s good to focus on paying off your loans and other debts, but you still want to set money aside for retirement, even if it’s just $1 every day, or $10 every paycheck. Something is better than nothing. Health Savings Accounts (HSAs) help you save to cover healthcare costs with contributions that are tax-deductible (or pretax, if made through payroll deduction) and any interest earned is tax-free. Because unhealthy ones are, among other things, expensive. An easy way to eat healthy is to look into the paleo diet. Whether it’s energy-efficient light bulbs or a smart thermostat, cutting costs on bills you have to pay can really help fatten up your wallet. You can also use a free app to find subscriptions and memberships to cancel, saving you money. Getting money back from Uncle Sam may be just the ticket to increasing your investments. If your boss rewards you for a job well done, consider taking part of that money and putting it toward your retirement savings or investments. Even if you retire at 65, you may opt to wait until you’re at least 70 to start collecting on Social Security to make sure you get the most out of these monthly payments. You may want to save more for your child’s education, but remember, they can take out a student loan or work a part-time job to pay for school. You can’t take out a retirement loan. Some people qualify for an Individual Development Account (IDA), where contributed amounts are matched. If you want more guidance from a professional, it’s a good idea to find one who is certified by the Certified Financial Planner Board of Standards. “Invest in the stock market, but first get educated in both types of investments and do the math,” said Robyn Mancell, partner at Girls Gone Forex, a company that teaches women how to trade in the market. I know this list has a lot of information. Don’t get overwhelmed thinking you need to so everything now. Pick a handful of items, implement them and move on to more. The easiest ones to start with are automating your saving and investing. In a few minutes, you can cross those off the list. Then you can concentrate on the others. It’s great to see what an amazing list you have compiled! All 50 points mentioned here are actually helpful in creating wealth. Especially loved the ‘Smart Thermostat’ idea. Apart from sensing and learning your exact requirements with a few days, they are also known to cut your energy expenditure big time. Must consider upgrading to one!